Spice up your Swim Platform with some Teak! 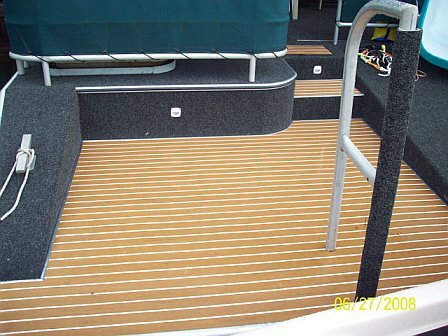 When I decided to replace the carpet on our 1998, 86 foot Stardust houseboat, I wanted to add a late model look to the boat. I decided to put a section of teak on the swim platform that is seen more often on expensive yachts. I had the perfect place on the platform where it was flat at the boarding ladder. 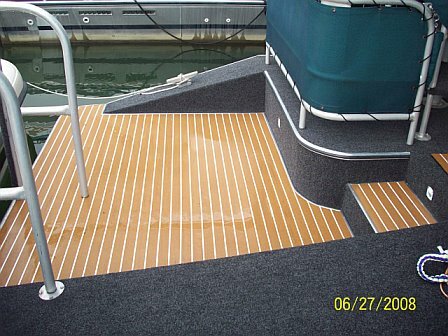 Except I did not use real teak, but a high tech composite like substance that is layed like real teak. It comes in approximately a two inch strip in different lengths. The strips are cut and glued together prior to laying the entire section. Then the section is glued to the decking. It was trimmed with chrome strips to give it a factory appearance. It has been a very good product, not slippery when wet. The best part, if it were to get scratched or stained, get out some light sandpaper and sand it off. Just like real wood except it will last longer. After an entire season, I have not had to look for any sandpaper yet! The product is from Nuteak.com. It is a little pricey, but you will only want to accent a small area. Check it out! (Add photos).